Upon completion of his internship in Miami, John was sent to Silver Spring, MD for a one week intern seminar to present his research along with other NOAA interns from around the nation. 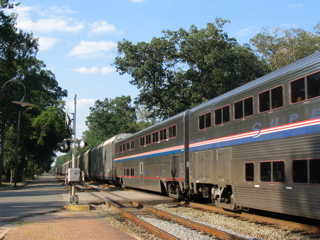 His northward journey provided his first solo overnight train trip which ended up being unforgettable as his Silver Star lost copious amounts of time including an overnight grade crossing accident which delayed the train for over two hours on its way to its 9:40pm arrival into Washington. 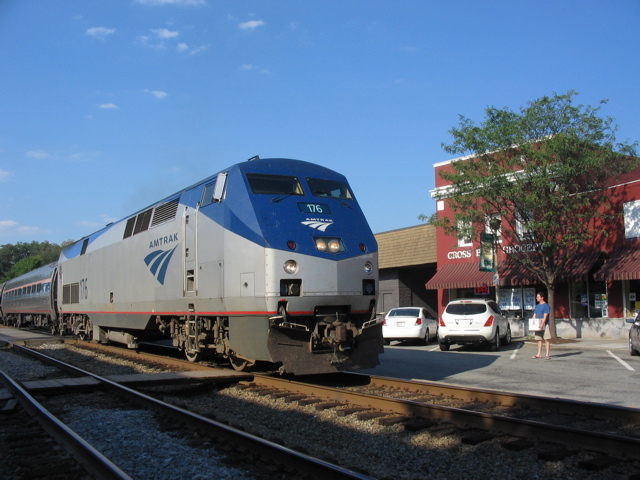 A few days later I would head north aboard Amtrak's AutoTrain to pick up John, all the while hoping that better timekeeping would await me. The four hour drive to Sanford, FL was uneventful and I checked in at 1:35pm on a steamy August 3, 2006. 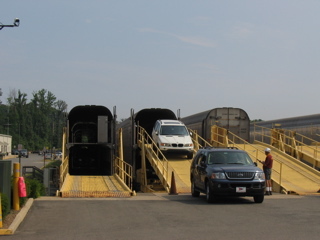 AutoTrain passengers drive their vehicles to a check-in point outside the Sanford station, remove hand luggage needed for the night aboard the train, then turn their vehicle over to Amtrak employees who drive it aboard the auto carrier train cars. The auto carriers are located at the rear of the train and the automobiles actually ride backwards so they can be driven right off the train at Lorton, VA. On this trip, AutoTrain consisted of 2 P42 locomotives pulling 16 bilevel Superliner passenger cars and 16 auto carrier cars. 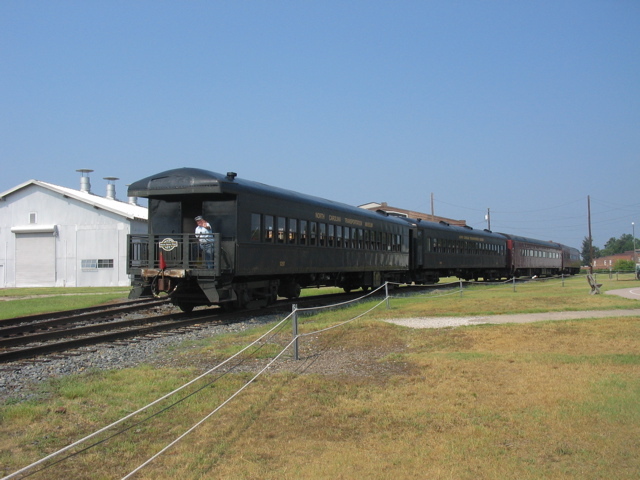 The train stretched 3/4 mile in length and transported 291 passengers and 141 vehicles. Inside the station waiting room I checked-in at the ticket office and selected my desired dining time for dinner from three choices: 5pm, 7pm, and 9pm. 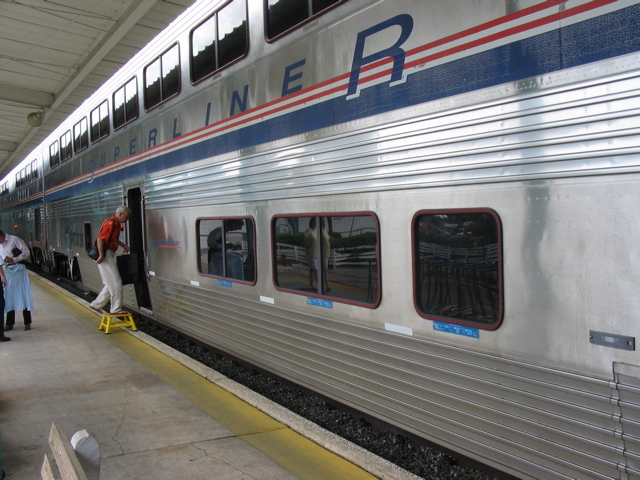 The northbound Silver Meteor sailed past a couple hundred yards away on the mainline at 1:50pm and at 2:30 the first boarding announcement was made for AutoTrain. I settled into roomette 3 in sleeper 32105 Oregon which had wonderfully cool air conditioning. 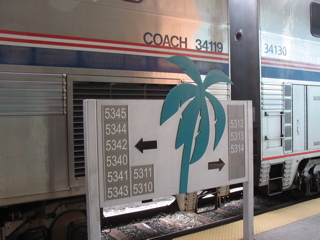 This car was somewhat out of place on AutoTrain as previously sleepers used on this train bore either the names of states along this train's route or the home states of its northern clientele. 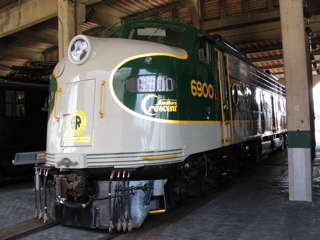 A couple of cars normally assigned to the Sunset Limited, including the Oregon, were stranded in Sanford when Hurricane Katrina shut down that train's route along the Gulf Coast and had been incorporated into the AutoTrain pool. 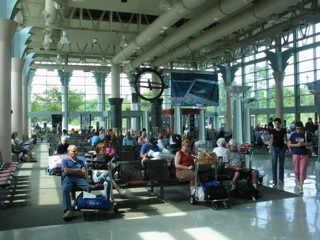 Auto Train boarding takes place on both sides of the platform. 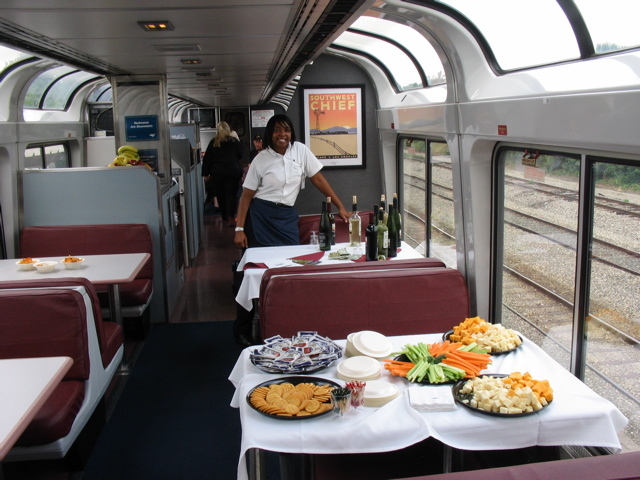 Sleeper passengers were summoned to the first class lounge car at 3:00pm for wine and cheese. 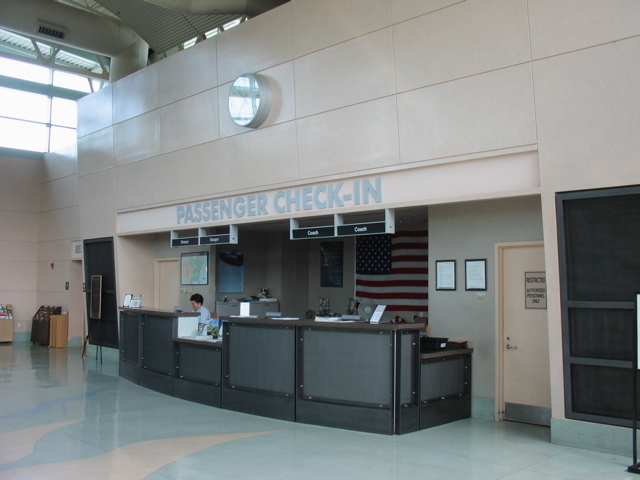 A friendly attendant welcomed me into the car which was set with crisp tablecloths and inviting baskets of fresh fruit, crackers, and assorted cheeses. 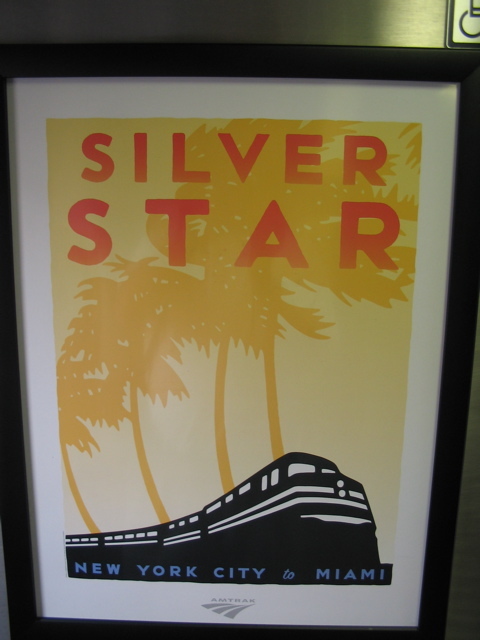 Outside the sightseer lounge's oversized windows, the southbound Silver Star was visible in the distance. Meanwhile, Amtrak workers were loading the last vehicles in the auto carrier cars across the driveway from the passenger platform. 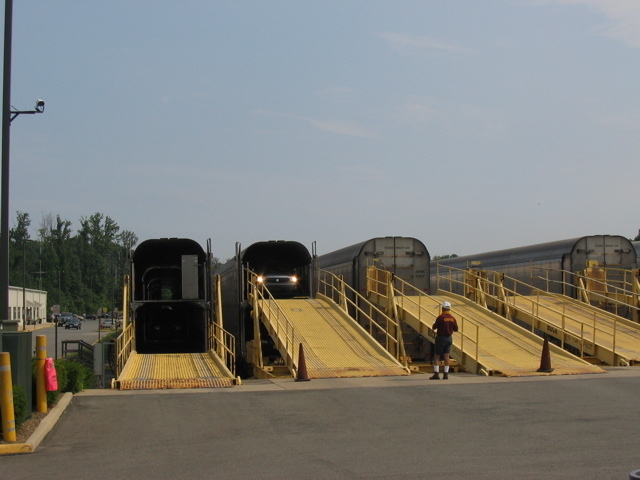 At 3:30pm a cut of five passenger cars that had loaded across the platform from us was pulled backwards by a switch engine and coupled to the rear of the main body of passenger cars. 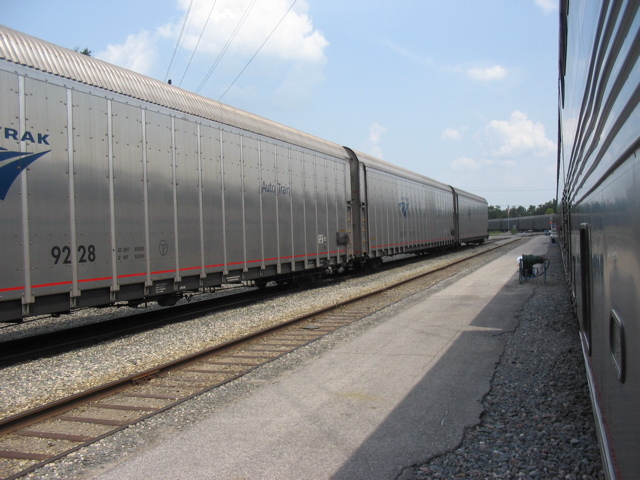 The auto carriers were then efficiently attached to the rear of the train and soon we were on our way a few minutes early at 3:50pm. 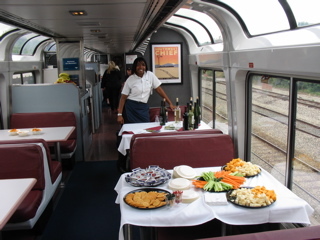 Friendly attendant at "Welcome Aboard" reception in the Sightseer Lounge car. 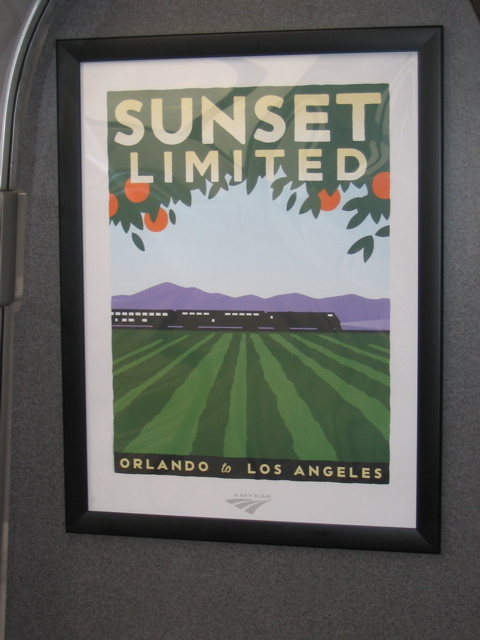 Framed Amtrak poster on the car bulkhead. Auto Train stretches around a curve at its Sanford Terminal. 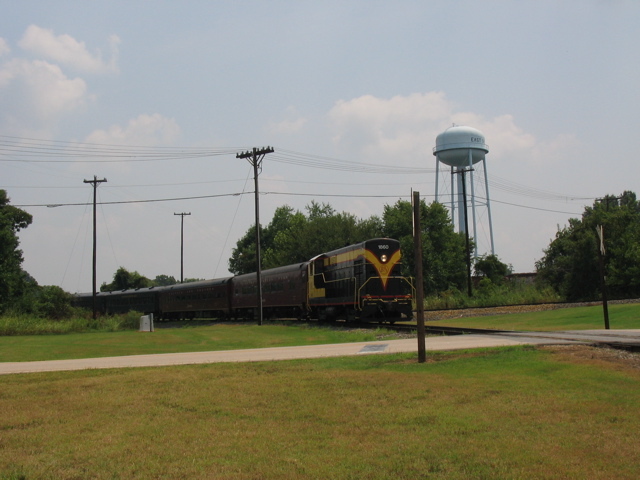 After entering the CSX mainline, we crossed the Lake Monroe drawbridge at 3:57 then assumed track speed for the jaunt through Orange City, DeLand, and DeLeon Springs. 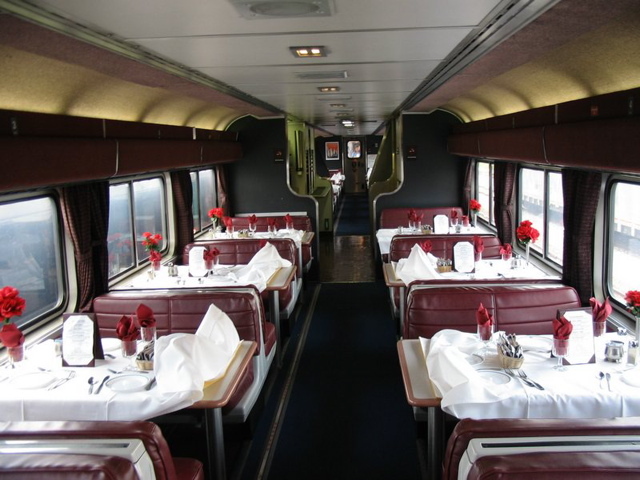 My dinner seating came at 5:00pm and I found myself eating in an almost private dining car as most of my fellow passengers had opted for later seatings. The meal was Amtrak dining at its best as I feasted on New York strip steak, baked potato, green beans, salad, and key lime pie accompanied by iced tea. 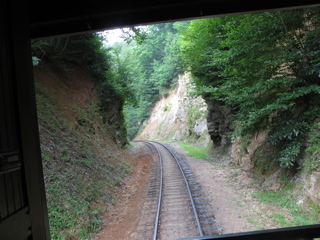 The view from the window was impressive as the 32 car AutoTrain traversed many curves through the woodlands of north Florida. 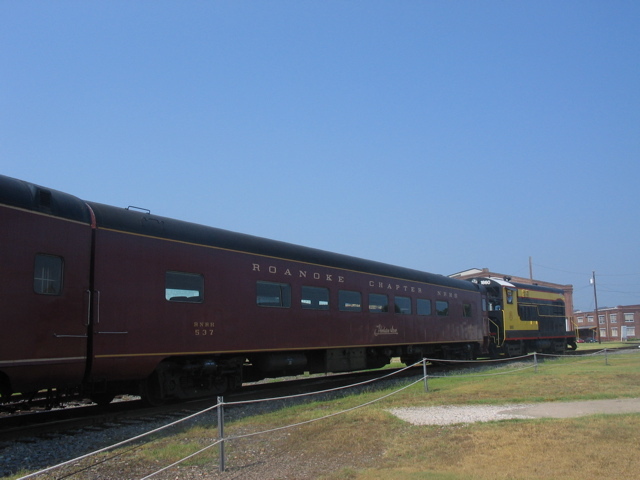 A 50 minute delay at West Toccoi for trackwork provided the perfect opportunity for a power nap back in my well cooled roomette before we passed through the scenic stretch from Green Cove Springs and Doctor's Inlet to Orange Park. 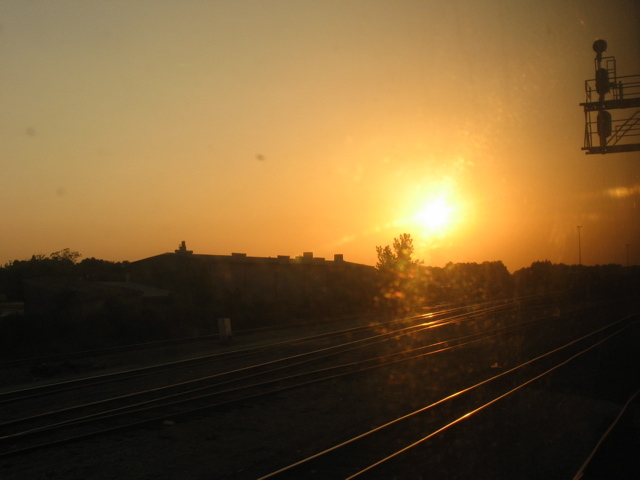 Twilight provided a nice view of downtown as we crossed the Ortega River at 7:35 and rushed past the Jacksonville Amtrak station at 7:58pm. 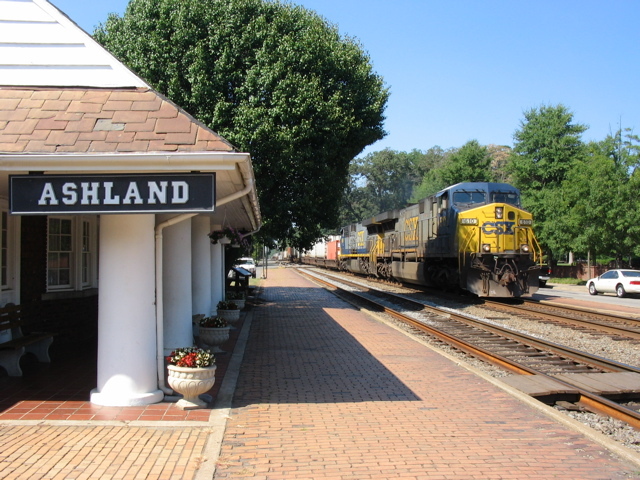 Darkness soon set in and the lights of small Georgia towns filled my window as we steadily made our way northward. I watched our passage of the Savannah Amtrak station followed by the Savannah River bridge 15 minutes later before turning in for a good night's sleep. I awoke to find the train stopped in Rocky Mount a couple minutes before 6:00am then intermittently watched our progress through sleepy North Carolina towns as I drifted in and out of sleep. 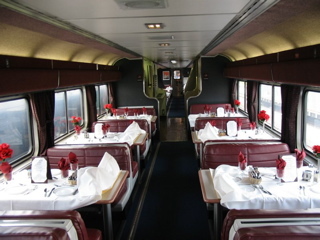 Finally I dragged myself out of bed, enjoyed a wake up shower, then made my way to the dining car for continental breakfast which consisted of corn muffins, cereal, bagels, and a banana. 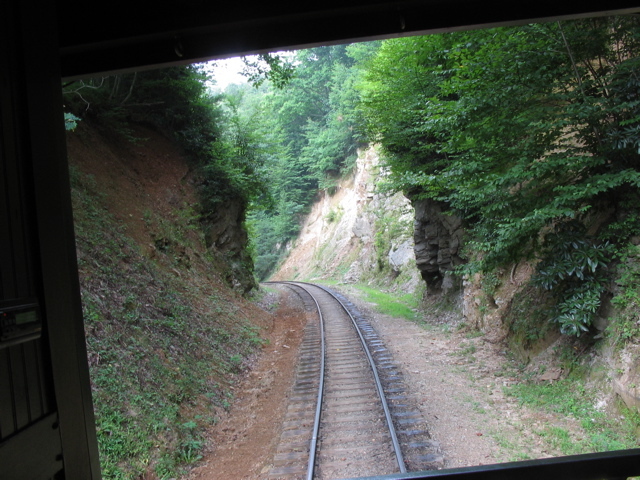 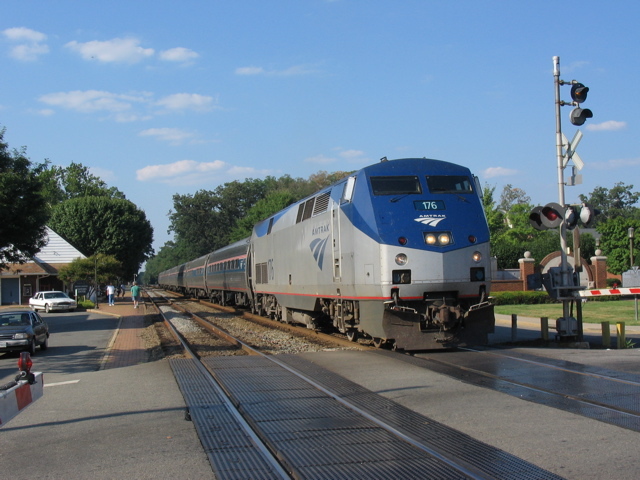 As I dined I watched the familiar sights between Petersburg and Richmond, VA that I have so often viewed during many train trips stretching back to my high school years in the 1969-72 period. 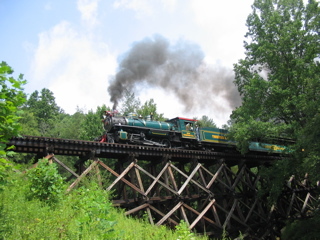 Crossing bridges high above the Appomattox and James Rivers has always been a treat especially on morning northbound trips. North of Richmond we passed down the middle of Center Street in Ashland and passed Randolph-Macon College where I spent the fall of my freshman year of college way back when. 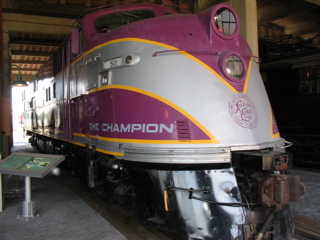 In those days I caught many a glimpse of the original privately operated AutoTrain whose 50 car trains dashed by in a streak of purple, red, and white trim. 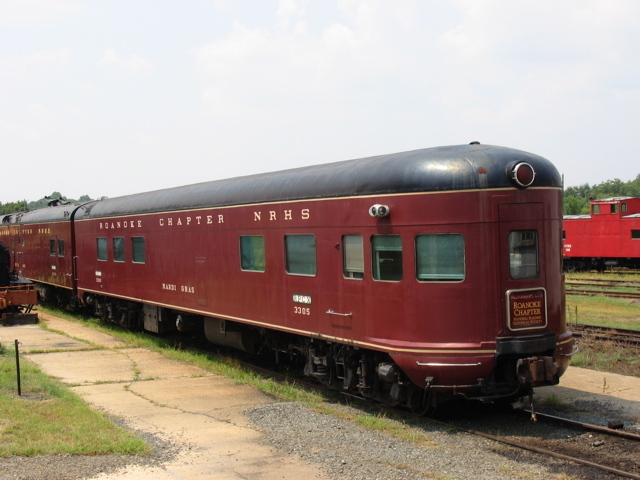 The journey ended at 10:00am as we pulled to a stop at the beautiful modern Lorton AutoTrain terminal. Within 45 minutes my vehicle was unloaded and I was on my way to a downtown rendezvous with my son. 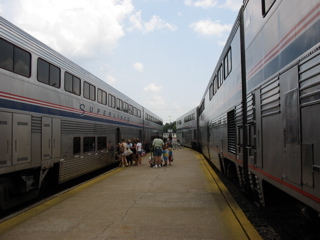 Passengers off the northbound Auto Train wait for their vehicles. 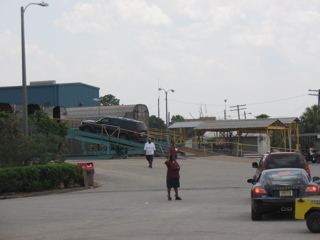 Workers unload automobiles at Lorton. 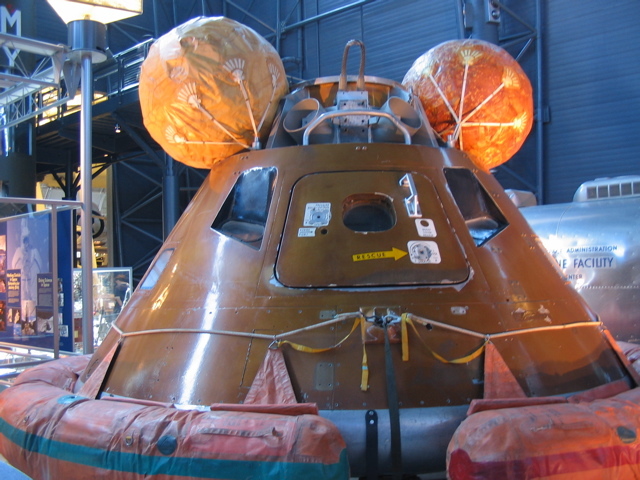 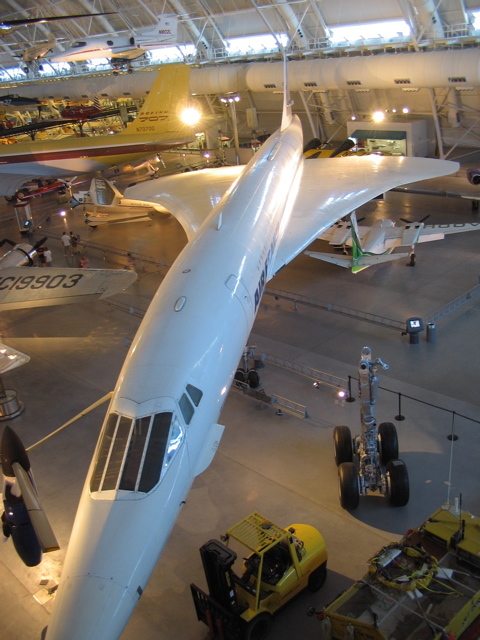 We spent the night at the Marriott Fairview Park in Falls Church, VA then headed to nearby Dulles Airport the next morning to tour the impressive new Air and Space Museum Annex which houses a wide variety of air and space craft. Included were the prototype space shuttle Enterprise, an Air France Concorde supersonic jet, the WWII bomber Enola Gay, and examples of almost every type of aircraft imaginable. 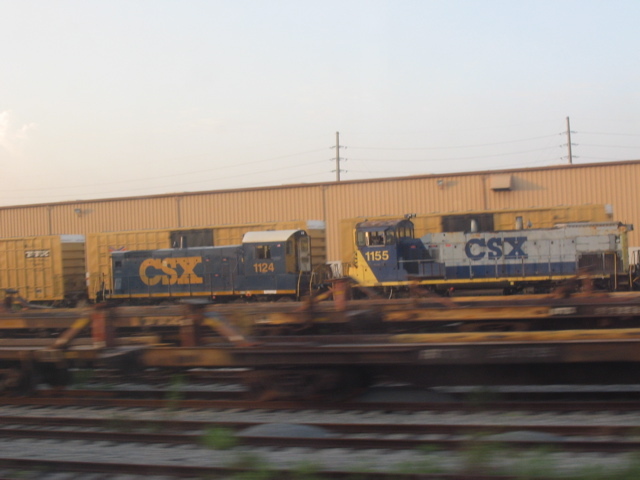 In the afternoon we drove south along traffic clogged I-95 to Ashland where we hung out by the old depot and watched five Amtrak trains and a couple of CSX freights pass during a 90 minute period. 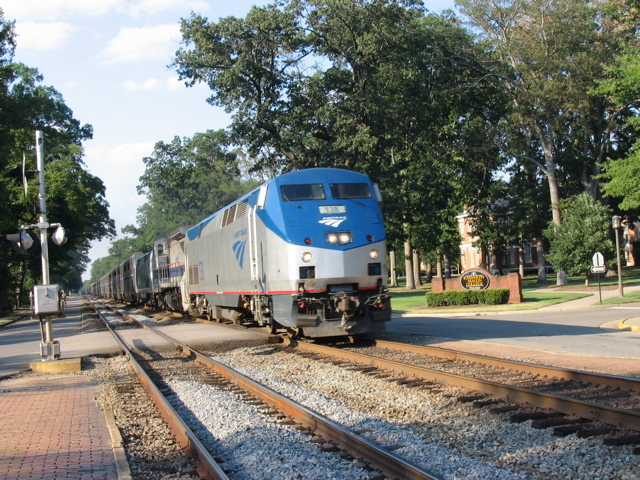 The evening was spent at the convenient Marriott off West Broad Street in Richmond's suburbs. 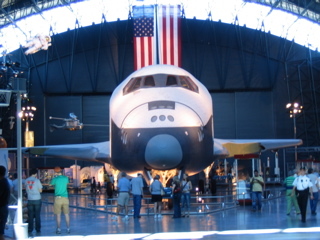 Prototype space shuttle "Enterprise" at the Air and Space Museum Annex at Dulles Airport. The northbound "Carolinian" arrives in Ashland. Richmond-bound regional train at Ashland. Scenic Ashland is a great train watching spot. The southbound Auto Train charges past Randolph-Macon College in Ashland. 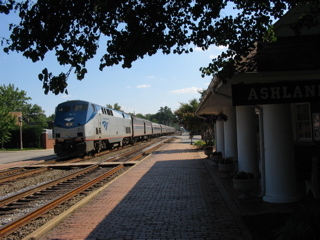 Auto Train storms through Ashland. # 307. 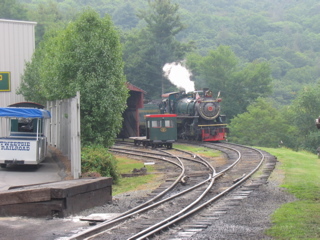 A giftshop and preserved equipment from other travel modes complement the collection. 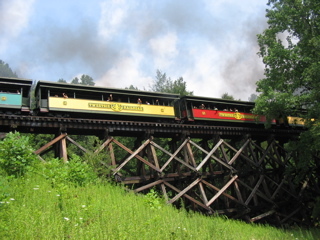 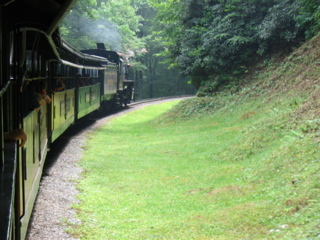 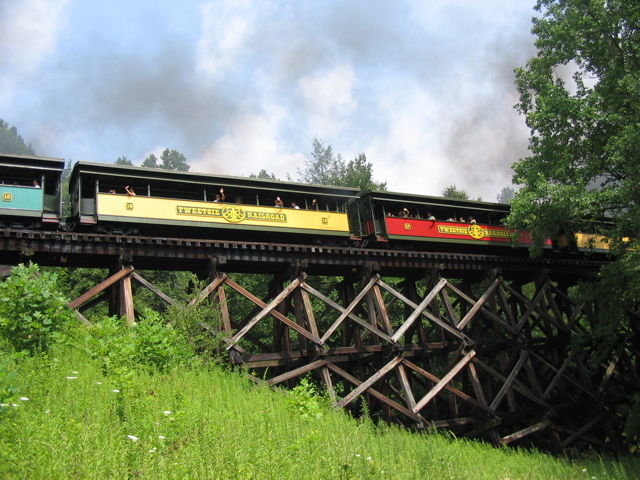 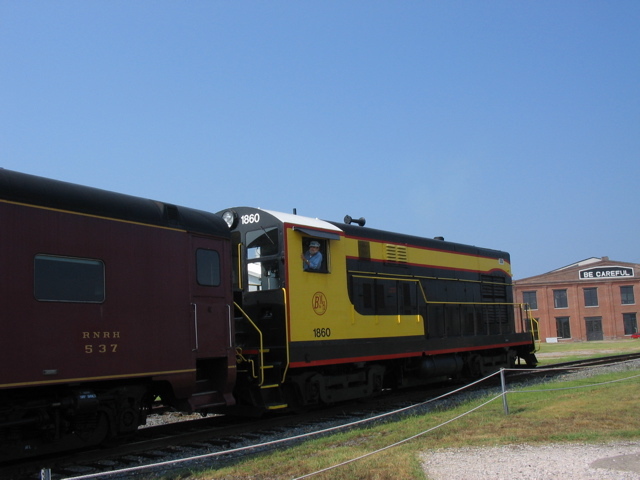 North Carolina Transportation Museum offers a short train ride. Former N & W coaches from the NS steam excursion program. F-M H-12-44 #1860 shoves the consist to the Spencer Shops Station. 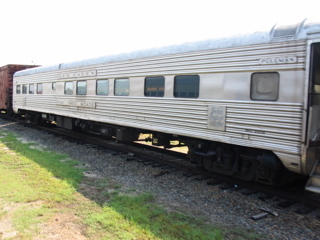 Former New Haven sleeper lounge "Pine Tree State"
Former Illinois Central observation car "Mardis Gras"
A couple of days later John and I visited one of our favorite rail-oriented locations, Tweetsie Railroad between Boone and Blowing Rock, NC. 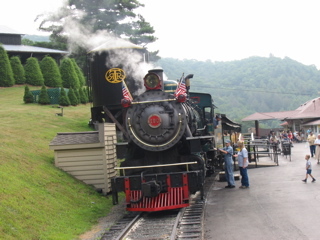 I first experienced Tweetsie back in the mid-1960s and the magic seems to never wear off. Original East Tennessee & Western North Carolina 4-6-0 steam locomotive number 12 or its 2-8-0 sister # 190, still pulls a set of open air cars around a 3 mile loop that passes across the tall Dead Horse Trestle, traverses rich forests and a rocky cut, and negotiates a pretty good grade that results in impressive stack talk from the steam engine. 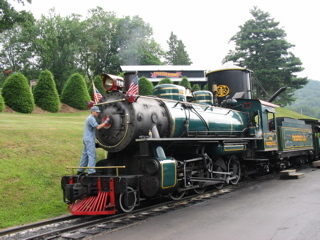 Admission to this original theme park is still reasonable as it allows unlimited train rides as well as unlimited rides on the park's fair-style rides and ski lift, and admission to various musical and dance shows. A special railfan weekend is held each September and other special events dot the calendar. Ample lodging is available in nearby Boone and Blowing Rock. 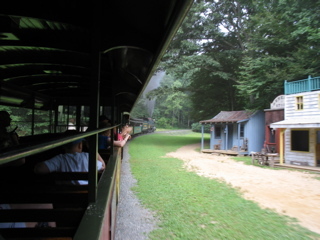 Forests envolope the Tweetsie line. 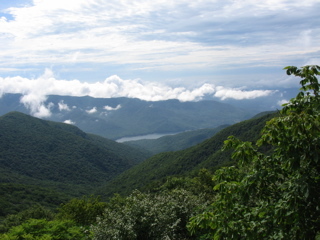 Blue Ridge Parkway vistas between Boone and Asheville. 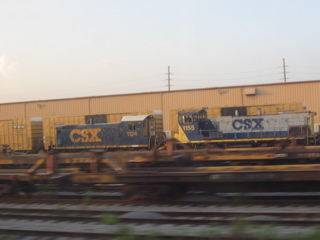 The final leg of our trip involved driving back to North Florida with the highlight coming in the form of a couple of short freight trains spotted while passing through southern Georgia. Sadly, once we left the Atlanta area we were far from the nearest Amtrak station and forced to dream about the next time we would step aboard a passenger train.